Ordering for Christmas? Here’s everything you need to know! For those of you thinking of ordering from our website for Christmas presents, we are pleased to say that the best before dates on all our Popcorn and Caramel Sauces are now all into 2018, so you can stock up now without needing to worry! Also last year, lots of you wanted to order from our website without us sending the parcel in a Joe & Seph’s branded box so that it was a surprise before the big day. I am now pleased to say that you just need to tick the “This is a surprise gift!” checkbox in the checkout process and we will send it in an unbranded box for you so it stays secret until the big day! DON'T LEAVE IT TOO LATE - LAST ORDER DATES! UK MAINLAND LAST ORDER DATE MIDNIGHT (GMT) 20th DEC 2017! Any orders received after these dates we'll still do our best to get them to you in time, but we can't guarantee they will arrive by the 25th December. As our elves are a little busier at this time of year, we might take a little more time processing and dispatching your order, so please allow for an extra day or two for your popcorn to arrive. If you have any special requirements then please do get in touch and we'll do our best to help! LAST ORDER DATE FOR PRE-CHRISTMAS DELIVERY! Usually we aim to have orders dispatched and shipped within 2 working days (UK Mainland), however over the busy Christmas period, this might take a bit longer. During this time, please allow up to 4 working days for delivery, as everything is hand cooked and hand packed, it can take a bit longer than normal to get orders out. However, you should receive an email with delivery details as soon as your order has been dispatched. Please note that our office, warehouse and kitchens will be closed from Saturday 23rd December – Monday 1st January inclusive for a break from popping! Any orders placed during this period will be picked up when we return in the new year and dispatched that week. During this time we can't guarantee that we'll be able to respond to any queries although we'll do our best to pick up any urgent queries. As our elves are a little busier at this time of year, we might take a little more time processing and dispatching your order, so please allow for an extra day or two for your popcorn to arrive. If you have any special requirements then please do get in touch and we'll do our best to help! New York Cheesecake, Your Greatest Flavour! To celebrate the release of Twentieth Century Fox's latest blockbuster musical, The Greatest Showman, starring Hugh Jackman & Zac Efron, we asked YOU to help us choose our next, limited edition flavour, inspired by the film. You voted in your thousands, and though it was extremely close, you have chosen our LIMITED EDITION popcorn flavour to be the showstopping …. Creamy with hints of Madagascan vanilla the authentic taste of New York, avaliable on our website NOW! Not the flavour you chose? Never fear, for those of you who favoured Toffee Apple or Classic Caramel, you will love our Toffee Apple & Cinnamon or Classic Caramel Popcorn both of which can be purchased on our website NOW! Look out for packs in store, online or at select local cinemas near you! The Greatest Showman in UK cinemas Boxing Day 2017! Win a Year’s Supply of Joe & Seph’s with the Greatest Showman! To celebrate the release of Twentieth Century Fox's latest blockbuster musical, The Greatest Showman, starring Hugh Jackman & Zac Efron, we're creating an inspired by, limited edition flavour to enjoy with the film. Joseph, our popcorn connoisseur, has created 3 flavours, linked to the film, but we need YOUR help to decide on which we create! Set in 19th Century New York, the exciting new musical celebrates the birth of show business, taking inspiration from the extraordinary life of the legendary P.T. Barnum. Will it be sweet and fruity TOFFEE APPLE, reminiscent of the circus and crisp autumnal evenings? Or the authentic taste of New York, NEW YORK CHEESECAKE, creamy with hints of Madagascan vanilla? Or maybe crowd-pleaser, CLASSIC CARAMEL is more your thing, made with our original recipe caramel? Cast your vote, and you could win A YEAR’S SUPPLY OF JOE & SEPH'S POPCORN, and be one of the first to try the winning flavour! Plus, SIX RUNNERS-UP will also win limited edition packs, and exclusive The Greatest Showman goodies! HOW DO I VOTE & ENTER? You can vote via our website: www.joeandsephs.com/thegreatestflavour or via our Facebook or Twitter pages – find us @joeandseph – using #GreatestFlavour to qualify! Voting will close on the 12th November at midnight and the #GreatestFlavour will be unveiled by the 19th November! Toffee Apple & Cinnamon Popcorn is Top of the Pops! Woohoo! We're proud to announce that our Toffee Apple & Cinnamon Gourmet Popcorn was crowned 'Top of the Pops' in a recent taste test for The Sun newspaper! As part of the taste test, 10 gourmet popcorn brands were scored out of 5. "4/5! CRUNCHY on the outside, soft and chewy in the middle, this toffee apple flavour transports you to bonfire night as a child. Sweet and delicious, it is different to any other toffee flavour on the market." We're Spicing Up National Chocolate Week! In celebration of National Chocolate Week 2017 we have launched a brand NEW flavour which packs a punch! Introducing Chilli Chocolate Caramel Popcorn, made using the finest Belgian Chocolate, followed by a kick of heat from the Red Pepper Chilli! Our brand NEW Chilli Chocolate Caramel Popcorn is the latest addition to our chocolatey range, including Double Chocolate Caramel, Orange Chocolate and our Great Taste Award-winning White Chocolate and Vanilla Bean Popcorn. Follow the link below, and be one of the first to get your hands on our newest flavour, sure to spice up your day. We’re proud to announce that from today, you can now find Joe & Seph’s Popcorn in lots of Waitrose stores across the UK, or on https://www.waitrose.com! Find a selection of our best-selling flavours, including Gin & Tonic, Salted Caramel and Peanut Butter Popcorn. 'Pop' down to one of the Waitrose stores listed below to try them for yourself, and don’t forget to send us a snap if you spot us in store! We've created what we believe to be the world’s first Prosecco Caramel Sauce! Making all your Prosecco dreams come true, Joe & his team of talented chefs have infused our original Caramel Sauce with fragrant Italian Prosecco, to create a rich, intense flavour with hints of Apple and White Blossom! Plus, we’re proud to announce that it has also recently won a 2017 Great Taste Award! As with all our products, the newest addition to our Caramel Sauce range is lovingly handmade in our London kitchens using only the finest ingredients, as you would at home! Try this delicious treat on cakes, breakfasts, ice cream, fruit…...or eat straight from the jar! We're extremeley proud to have won 5 more Great Taste Awards from the Guild of Fine Foods, now giving us a grand total of 34 awards across the range! Thanks for the mention guys! Joe & Seph’s: Lloyds Bank National Business Awards 2017 Finalist! We’re really excited to announce that we’ve been shortlisted for the Small to Medium Business of the Year Award for the 2017 Lloyds Bank National Business Awards2017 Lloyds Bank National Business Awards! Celebrating the contribution of SMEs to the UK economy, the Small to Medium Business of the Year Award, recognises those who have maintained consistent growth and strong financial performance, understands its customer, has an engaged workforce with effective leadership, and is continually innovating to support future growth. All of us at Joe & Seph’s are honoured to have been shortlisted amongst some of the best businesses in the UK, chosen from hundreds that entered this year’s awards, and we are now busy prepping for the second and final round! Who saw us on ITV News? We were very excited to be on ITV News on Sunday night... well Adam was! He talked about the story behind Joe & Seph's, how we handmake all our delicious popcorn and also focused in on the importance of exports! We were featured on Channel 4! Would you believe it, our popcorn has gone all celebrity on us and was featured on Channel 4’s programme 'Secrets of our favourite snacks'. Simon Rimmer and Sophie Morgan explored the science and psychology of snacking, and how your favourite snacks are made – including Joe & Seph’s popcorn! 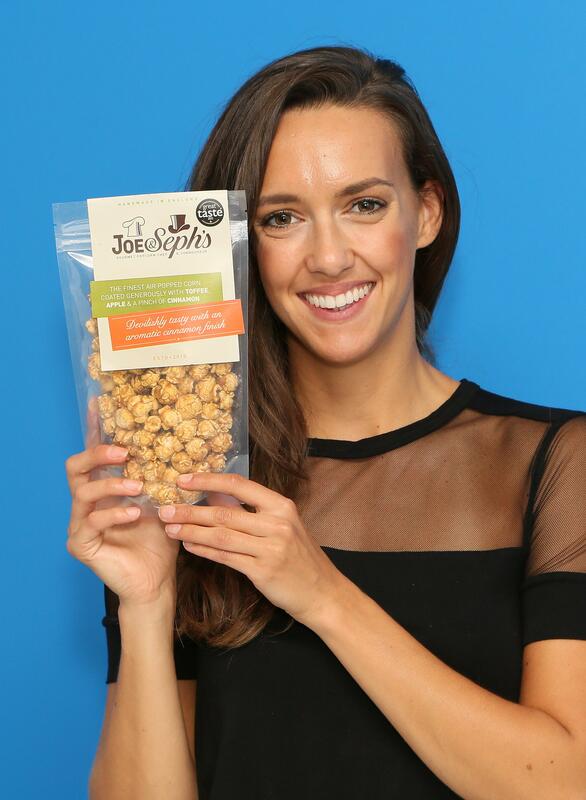 Our founder and ‘popcorn connoisseur’ Joseph showed how every batch of our handmade gourmet popcorn is created, and gave a sneak peek behind the scenes at Joe & Seph’s HQ. Introducing Peanut Butter & Chocolate Caramel Popcorn! Yes that's right folks, we’ve combined our best-selling Peanut Butter Caramel Popcorn with indulgent Belgian chocolate for the ultimate flavour combination! Treat yourself to a pouch right now, and be one of the first to taste our delicious NEW FLAVOUR! It truly is scrumptious and with every mouthful you’ll enjoy our signature smooth caramel, followed by Belgian chocolate, and a deliciously nutty crunch! Sound like it’s up your street? We’re so excited to be attending Taste of Amsterdam that we’re giving away three pairs of tickets to this year’s show (2-5 June) along with a delicious bundle of popcorn! Ts&Cs. Winners will receive one pair of tickets to Taste of Amsterdam valid for any one day of show open, 2-5 June 2017. Travel and accommodation not included. Bundle of popcorn can be collected from the Joe & Seph’s stand, M11, onsite at the show. Introducing the World's First Fairtrade Popcorn Easter Egg! This first of its kind chocolate egg combines a seriously smooth thick Divine milk chocolate shell embedded with our delicious Salted Caramel popcorn - it's an irresistible combination of soft and crunchy, and sweet and salty with the contrast of milk chocolate and popcorn. Each pack comes with two 18g packets of our Fairtrade Salted Caramel popcorn too - just in case you need more to munch on! The partnership between Divine Chocolate and Joe & Seph's came about from a plane journey back from the biggest sweets and snacks show in the world. "Wouldn't caramelised salted popcorn and smooth milk chocolate be a combination made in heaven?" "What about an Easter Egg with the popcorn embedded in the thick milk chocolate shell?" Find out more about our delicious Divine Milk Chocolate Popcorn Easter Egg and try it for your self HERE!